I have to admit that since you can now find cauliflower already chopped up and ready to use there is no excuse not to make this. I used to have to chop the cauliflower in my processor which was time consuming and I would have to dry it on towels as it was always slightly watery. Now it’s available in pre-prepared cauliflower rice packages and this is a “game changer”. Both Green Giant chopped cauliflower in a bag as well as at Trader Joe’s and Whole Foods. The pre-chopped bags come in 16 ounce size bags which is what I used for this recipe. You can buy extra bags and keep them frozen! It’s wildly popular so grab it while you can and get a few extra bags while you’re at it. Of course you can always chop your own if you don’t have access to any of these products. This was so delicious I have added chicken and shrimp but you can certainly leave it vegetarian and add more vegetables or tofu. There are so very many variations on this theme, feel free to go wild with it. 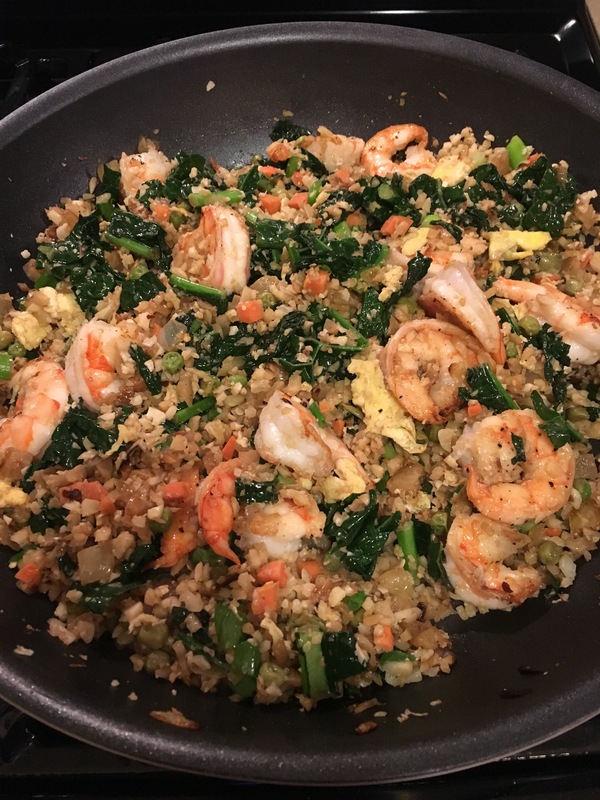 It’s a low carb alternative to regular rice and a delicious healthy way to do so. I served it up in a large bowl and it was really a filling delicious dinner. This is what I did and the next night I heated up left-over rice and topped with a fried egg! Delicious! Heat 1- 2 Tablespoons Vegetable Oil in a large skillet or wok over medium high heat. Add garlic and onion to the skillet and cook, stirring often, until onions become translucent, at least 5 minutes. I like my onions translucent for this recipe. Lower the heat and stir in peas and carrots (and any other veggies you’d like) and cook until vegetables are tender, about 5 minutes. I ended up using the 2 Tablespoons of oil, do what works best for you. Right before the next part I threw in some torn up Kale pieces. The kale cooks down rather quickly . Then I added the next part. If you’d like to add kale . 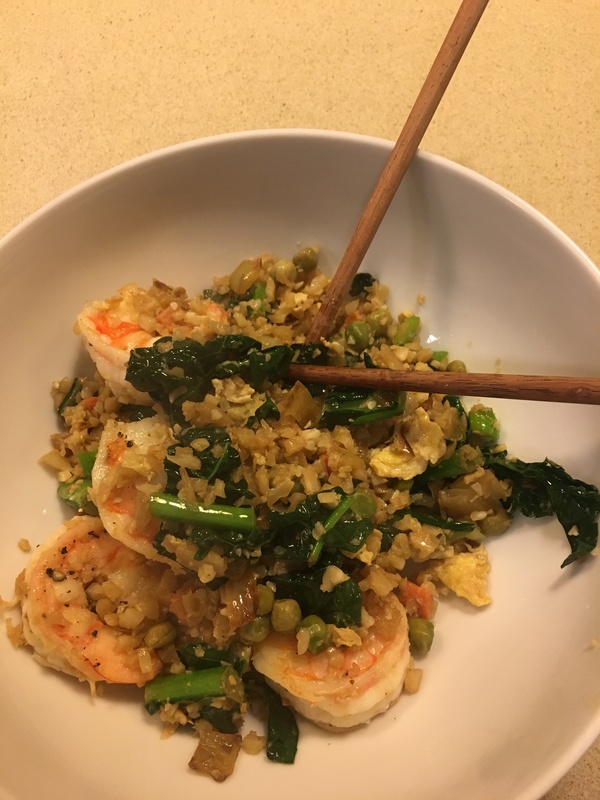 Stir in the cauliflower, diced up eggs, green onions and soy sauce mixture. Cook, stirring constantly, until heated through and the cauliflower is tender, about 5 minutes . Taste for soy sauce and add if necessary. I didn’t add any salt because the soy sauce was salty enough. After the first five minutes of cooking I throw in the cooked protein that I am using and continue to heat it all up stirring as I go. If you ‘d like you can also add more soy sauce at this point. Just heat till hot and serve. 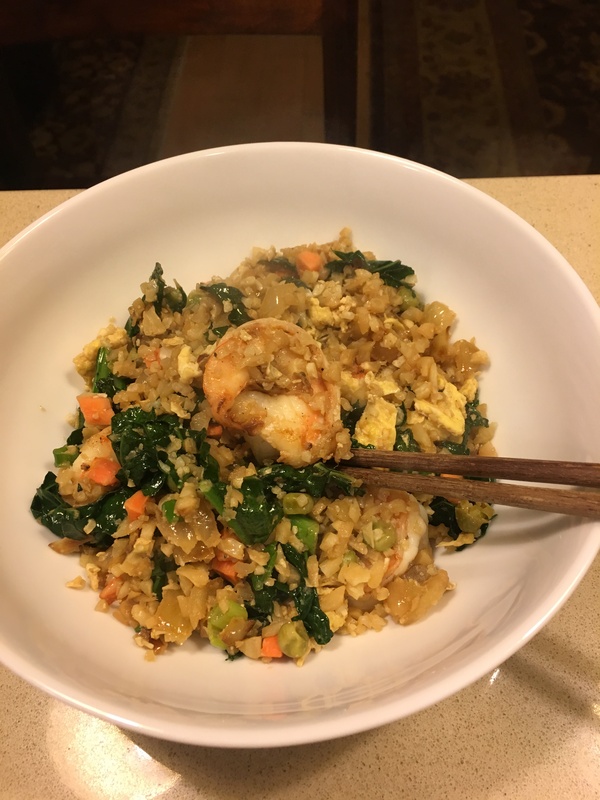 My new obsession is cauliflower rice and I have to admit that since you can now find the cauliflower already chopped up and ready to use there is no excuse not to make this. I used to have to chop the cauliflower in my processor which was time consuming and I would have to dry it on towels as it was always slightly watery. Now it’s available in pre-prepared cauliflower rice packages and this is a “game changer”. Both Green Giant chopped cauliflower in a bag as well as at Trader Joe’s and Whole Foods. The pre-chopped bags come in 16 ounce size bags which is what I used for this recipe. You can buy extra bags and keep them frozen! It’s wildly popular so grab it while you can and get a few extra bags while you’re at it. Of course you can always chop your own if you don’t have access to any of these products.